Former sheepfold restored this year. This sheepfold, full of charm, with a 180° view from the Alps to the Lérins Islands, will offer you unique memories and dream-like holidays. Highly recommend this beautiful property. Edwina & Xavier are friendly, lovely hosts. They met us on arrival & gave us a great tour of the house. They had thought of everything to make our stay enjoyable - with lots of extra touches to make it feel like home. The pool & pool area are fantastic. Would return in a flash! We were happy to be able to improvise dinner as your arrival was a bit late. Happy too to solve the problem of the locks before departure. Have a safe trip home and come again when you wish. We had a wonderful experience staying at La Bergerie. Edwina met us at the villa upon our arrival and gave us a thorough orientation. The view from the villa is amazing. There is tremendous attention to detail in her hospitality. The location is not walking distance to anything, so a car is a must. However, nothing is very far away. We could be at the beach, Cannes or Antibes in less than 10 minutes. The tremendous view more than makes up for the lack of walking convenience and we would be thrilled to stay at La Bergerie for a future visit. The pictures do not begin to describe how beautiful the house and grounds are as well. We are very happy that La Bergerie and that your vacation was a great success. Guests like you are a gift. We hope to receive you soon again and will do everything in our power to make your stay perfect. We stayed at La Bergerie for 11 nights at the end of August. Edwina and Xavier are such warm and welcoming hosts, and gave us a great tour of the house before leaving us to enjoy a well earned break. This is a stunning property in a quiet area up in the hills, with amazing spaces both indoors and outdoors. The ground floor has a living room, a dining room and a large kitchen. The first floor has two bedrooms and two bathrooms. On the lower ground floor there are two separate bedrooms (accessed from the outside). This setup was ideal for us, as the house didn't feel too big (there were only two of us), but it still provides plenty of space for larger groups or families. The interiors are really homely and very tastefully decorated and furnished. Everything is in perfect working order. The outside spaces are to die for. The amazing terrace has panoramic views and plenty of space for dining and spending time. The pool area is set below the house in the garden, and has a separate dining area, WC/shower and plenty of decking areas. The pool itself is stunning, and a very good size. The house is a short drive from Vallauris, with various shops etc. Golfe Juan is also nearby, and has good beaches and plenty of restaurants, cafes etc. The other attractions of the riviera are all nearby, including Antibes, Juan Les Pins, Cannes, and lots of goregous hilltop villages like St Paul de Vence and Tourettes-sur-Loupe. A car is essential for staying here. We had some issues with power cuts due to a huge storm, but these were resolved extremely quickly by Edwina. 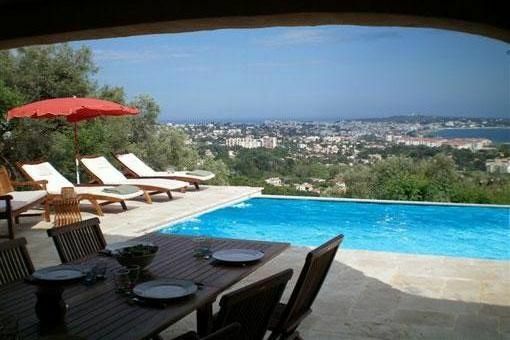 All in all, this property can be very highly recommended for a relaxing holiday with family or friends in the heart of the bustling Cote d'Azur. Thank you Edwina and Xavier for your warm welcome and for sharing your home with us! Amazing house and even better location!! We had an amazing stay right from day one. We even got lost finding the house and the owners son came and met us which was a big help. The house is all you could hope for in a honeymoon stay with instructions for all our needs. The view is the best I've seen with great seating so you can have a glass of rose and enjoy the sunset. It is in driving distance to Monaco and Cannes to which we went shopping and drove on the F1 track. The owners were very helpful and recommend anyone to stay here was our best holiday to date. Es una casa esplendida, muy comoda y con una vista panorámica inmejorable a Antibes y Niza. Me alegro muchísimo que nuestra casa les haya gustado tanto y esperamos volverlos a ver dentro de poco.